In his bid to ensure effective service delivery among his workforce especially solid waste management in the state, Governor Nasir El-Rufai on Tuesday distributed supervision equipment worth #9million to environmental supervisors through the Ministry of Environment and Natural Resources (MENR). Solid waste management supervision equipment distributed at the ministry include 20 unit of motorcycle, 50 pieces of crash helmet, 20 pieces of walking talking, 50 pieces of rain coat, 50 pieces of safety boot, 100 reflective jacket and 8 high definition camera. The equipment is long overdue considering the nature of Kaduna environment network where the supervisors have to trek kilometres before they could supervise their field workers. 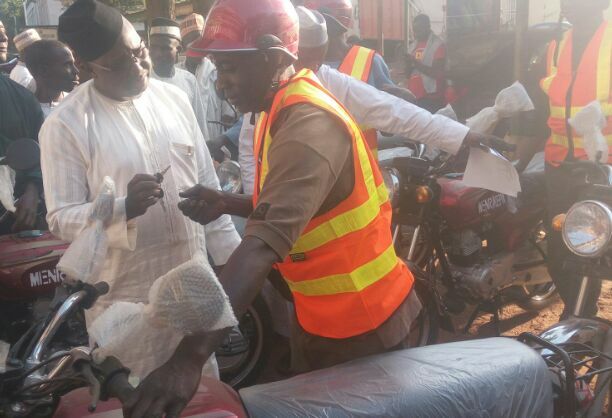 Distributing the items on behalf of the governor, Commissioner, MENR, Shehu Balarabe Giwa said the project was just another initiative of the governor to make Kaduna environment cleaner by a way of doing the talking. He said, “the governor has graciously approved a budget line for the ministry to purchase these items to be distributed for supervisors at the ministry and Kaduna State Environmental Protection Authority (KEPA) for more effective service delivery in their respective franchise area. It cost the state government about N9 million. “Our government is different from any other government the state has witnessed. Whatever we are doing is going to stand the test of time because it must have passed through extensive studies and deliberations and all that. So, the issue of continuity won’t pose any threat to the initiative. This administration is determined to deliver real dividend of democracy to our people. “The good people of the state are already seeing the good work this administration is doing, making great impact in all the sectors of the economy than ever before. So, people should put on their cap of good hope expected in Kaduna. While we want to encourage the beneficiaries to know that to whom much is given, much is expected hence the need to make judicious use of the equipment as if they owned them”, added the commissioner.